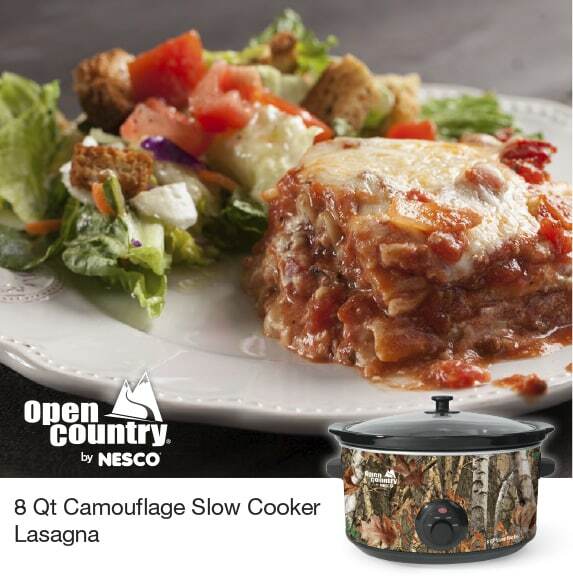 If you like Italian food you’ll love this recipe for Lasagna made simple with your 8 Qt Slow Cooker from Open Country by NESCO. With just a few simple ingredients you’ll have a light fresh dish you’ll love to serve to family and friends. In 8 quart Camouflage Nesco® Slow Cooker cooking pot, put two cups of your favorite meat or veggie tomato sauce. Put three lasagna noodles on top, then another layer of sauce and 1/2 cup of shredded cheese. Continue to build two more layers and reserve 1/2 cup of cheese. Cover and cook on LOW for 6 hours. Sprinkle with remaining cheese and cook an additional 10 minutes.